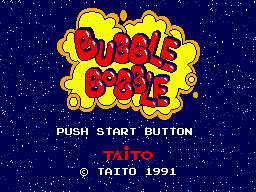 Bubble Bobble is an arcade game developed by Taito and released in 1986. It was subsequently ported to a variety of systems including the Sega Master System and Sega Game Gear. In Japan, the Master System version of the game is called Final Bubble Bobble (ファイナルバブルボブル), while in Brazil this version is called Dragon Maze. Bubble Bobble follows two humans who have been transformed into dragons named Bub and Bob. The must progress through various mazes capturing enemies within bubbles and then popping said bubbles. A sequel to this game was later released as Rainbow Islands: The Story of Bubble Bobble 2. The two Sega versions are relatively faithful ports of the arcade game, although adjust their levels to suit the differing screen resolutions. This is particularly noticeable with the Game Gear version, as although the objects in the game are the same size, the play areas are much more cramped so as to avoid screen scrolling. Main article: Bubble Bobble/Magazine articles.